We have the perfect gift for the wine loving reader in your family, or the book loving wine drinker! 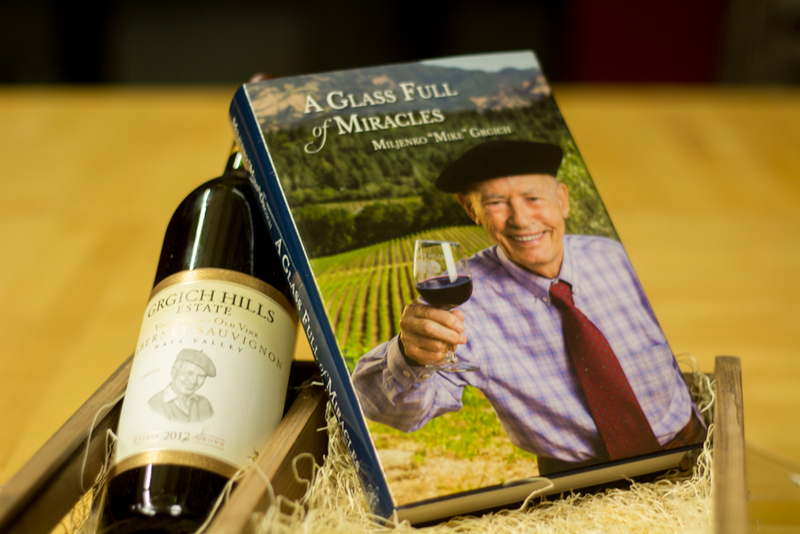 This Grgich Hill Estate Old Vine Cabernet Sauvignon comes with "A Glass Full of Miracles" is the long-awaited autobiography of Miljenko "Mike" Grgich, Napa Valley legend and Vintner Hall of Fame inductee. This wine is made from some of the oldest Cabernet Sauvignon vines in the Napa Valley, planted in 1959 to the Inglenook clone (also known as Niebaum Cabernet Sauvignon #29) on St. George rootstock in Yountville. Closer to San Pablo Bay than warmer Rutherford, this relatively cool region allows the grapes plenty of time to develop unique flavor characteristics. This complex wine with moderate tannins is aged in French oak for 21 months then moved to large oak casks for six additional months.